Today I have for you a review that is long overdue. 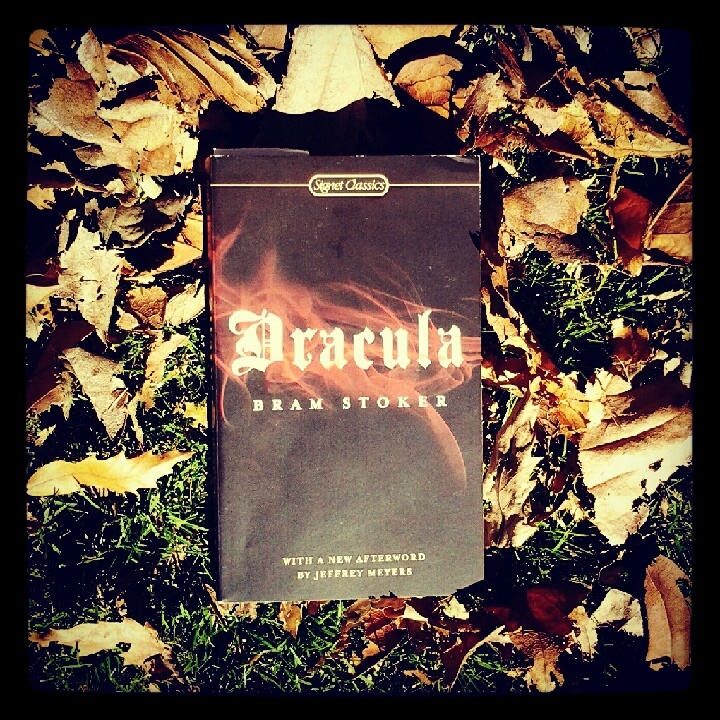 Bram Stoker's Dracula is a book I began for Halloween. Regardless of that, it is a book that is appropriate throughout the year. I had been meaning to read this book for quite some time. Not being a huge fan of modern Vampire novels I wanted a taste of a classic and used Halloween as my excuse to finally pursue this novel. "Count Dracula sleeps in a lordly tomb in the vaults beneath his desolate castle. His stony eyes are open. His cheeks have the flush of life beneath their pallor. On his lips are a mocking, sensuous smile and fresh blood. He has been dead for centuries, yet he may never die....Here begins the story of an evil both age-old and forever new. It is the tale of those who instill a diabolical craving in their victims, the men and women from whose blood they draw their only sustenance. It is a novel of peculiar power, of hypnotic fascination. The reader is warned that he who enters Castle Dracula may not escape its baleful spell even when he closes this book." I think most have an idea of what Dracula is about. With social media it is difficult to not hear spoilers from new books and movies much less old ones. It is no surprise to anyone that Count Dracula is a blood thirsty vampire. However, upon starting this novel I was afraid that either Dracula's position as a vampire or transformation into a vampire would be the climactic focus of the novel. Luckily that was not true. The reader learns very early on that Dracula is non-human and, from there, the real story begins. My favorite part about Dracula has to be the various points of view this novel is written in. The novel displays letters/diary entries/etc. from at least five different characters and interchanges between them throughout the novel always managing to switch perspectives to keep things entertaining. The progression of events is smooth and creepy, creating a perfect late-night read if you like giving yourself a little scare. The characters, for the most part, were generally likeable though I admit that I excepted Dracula to be a bit more badass, given his reputation. The plot itself was interesting nonetheless and the book was difficult to put down. "How can women help loving men when they are so earnest, and so true, and so brave!" Fortunately enough, these lines were few and far between that I was able to tolerate it. Overall, I thoroughly enjoyed Dracula. I'm not accustomed to reading such action-packed novels and am very happy with my choice. This novel truly is a classic in its genre. "smooth and creepy" oh I like this. I take it the novel didn't go too in-depth with Dracula's history? It did, but maybe not quite as much as you're hoping for. 6th Day of Christmas: China Glaze "Tinsel Town"